Pocket cams need something extra to set themselves apart from legions of video-shooting smartphones these days. The second-gen Kodak Playsport makes its name by being rugged; its little brother, the new Kodak Playfull, does so by being tiny. Most of us already walk around with decent pocket cams in our pockets—our smartphones. But there are places our smartphones can't go! Like underwater! 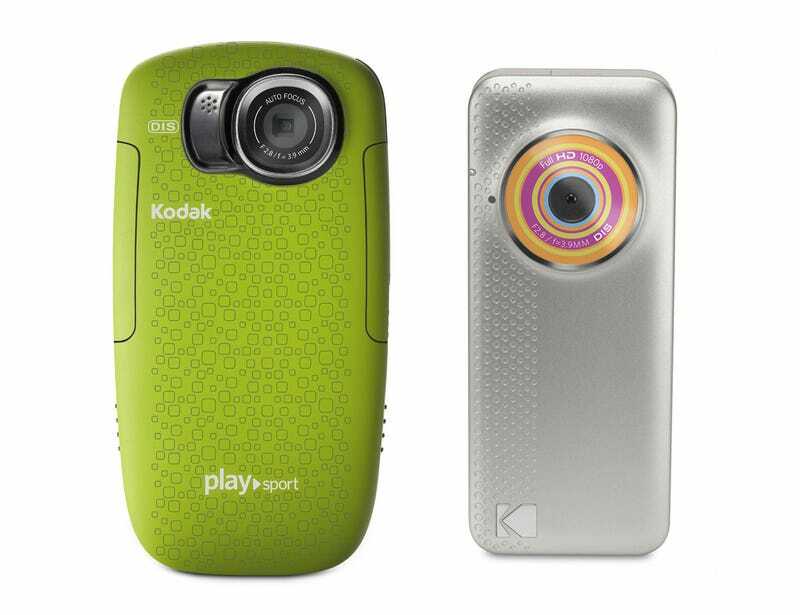 The second-generation Kodak Playsport pocket cam takes up where the first one left off, shooting 1080p video up to 10 feet underwater while adding dustproof and shockproof statuses to its adventure-ready resume. The new model still shoots 5MP stills, though the sensor's been upgraded for better lowlight performance and the Li-Ion battery's now 25% beefier. It's also got a newly-bestowed autofocus, film effects for prettying up your videos both pre- and post-shooting, and a new hardware share button for getting things going once you're plugged into your computer. It'll be on sale at the end of March in a buncha colors for $179.95. ROCHESTER, N.Y., Jan. 4 - Whether you like to party in the hottest clubs or shred from the highest peaks, Kodak has an HD pocket video camera for you. Eastman Kodak Company today introduced two new additions to its award-winning pocket video camera portfolio – the KODAK PLAYFULL Video Camera that's packed full of features in an ultra slim and chic design and the next generation of the KODAK PLAYSPORT Video Camera that's shockproof, dustproof and waterproof up to 10 feet. Both video cameras feature Kodak's exclusive Share Button making it easy for you to share your videos and pictures with friends and family in three simple steps. Kodak offers the world's only cameras with 3-step sharing.1 New in 2011, Kodak has added TWITTER as a sharing destination as well as two more international sites. "Kodak has an HD pocket video camera to suit everyone, whether you want to capture your moments at the party or the club, on the mountain or on the water," said Phil Scott, Vice President of Marketing, Digital Capture and Devices, Kodak. "The KODAK PLAYFULL and KODAK PLAYSPORT Video Cameras also feature something no other camera has – the Share Button – so it's simple to share life's moments with your social network." Featuring a hip and stylish design, the KODAK PLAYFULL Video Camera not only fits in the pocket of your skinny jeans but looks good with them too. It is made for social butterflies and social networking superstars. You can capture your best friend's birthday party or a night at the fashion show in full 1080p HD video or 5 MP stills. Then simply press the Share Button to tag to your favorite social networking sites and email, and connect to your computer for automatic upload. The KODAK PLAYFULL Video Camera will be available in silver, blue-silver, purple-silver and blue-black for U.S. $149.95 in spring 2011 at major retailers and Kodak.com. The next generation of the popular and award-winning KODAK PLAYSPORT Video Camera is designed for your adventurous lifestyle. In addition to being waterproof up to 10 feet, it's now also shockproof and dustproof to withstand tough conditions and elements like dirt, dust and sand. Take it snowboarding, snorkeling, mountain biking, whitewater rafting or wherever your active lifestyle takes you. Capture your adventures in full 1080p HD video or 5 MP stills, then press the Share Button to easily share them with your social network. The Kodak PLAYSPORT Video Camera will be available in black, red, green, white and aqua for U.S. $179.95 in spring 2011 at major retailers and Kodak.com. Kodak also offers a full range of gear to get the most out of your pocket video camera wherever you take it, including the KODAK Essential Floating Wrist Strap, KODAK Essential Action Mounts, KODAK Gripping Tripods, lenses, portable power and more. The International Consumer Electronics Association (CEA) recognized Kodak's first generation PLAYSPORT Video Camera as a winner of the Innovations 2011 Design and Engineering Award and Best of Innovations Award.